Sign up for Columbus Monthly's e-newsletter! Four years ago, just before Columbus MC Illogic was about to perform at the Honey Hive Gallery in San Francisco, an opening set by San Jose producer/rapper/singer Lucid Optics caught his ear. “His beats were insane. I talked to him afterwards and asked, ‘Who produced your stuff?’ And he said he did,” Illogic said recently during an interview Downtown. “I just asked him right then and there if he wanted to work on an album together.” After four years of emailing tracks back and forth in a long-distance collaboration, the resulting 10-track album, Lucid Logic, is here; the rapper will celebrate with an album-release show on Sunday, Sept. 3 at Double Happiness. Miami Dolphins, Queer Kevin at Cafe Bourbon St. It's time for the weekend. There are some events happening around town to help out those in Houston. The CoffeeFest has been announced and tickets are going quickly. It's the last weekend to take Zoo Bus and get discounted admission to the Zoo and Zoombezi Bay. There are contests open for Bacon Fest, Nathaniel Rateliff and the Night Sweats, Sublime with Rome, and Steve Miller Band. The Nationwide Children's Hospital Championship at The Ohio State University Golf Club Scarlet Course goes through Sunday. Columbus Documentary Week starts at the Gateway Film Center. It's the final weekend to see paintings of Cuba at Sharon Weiss Gallery. Watch a documentary about Highlights. Blockfort hosts an artist talk with Brian Reaume about his exhibition a gilding denial. Watch OSU take on Indiana for the start of OSU Football season! Are you signed up for Sugar Skulls for Day of the Dead with Leticia Vazquez? Enjoy the VIVO Music Festival. Head to the latest Not So Late Show with Johnny DiLoretto. The Scioto Audubon is the spot for a Yappy Hour. Clippers take on the Mud Hens. It's the final weekend for the Actors' Theater in Schiller Park, showing The Tempest. Comedian Kountry Wayne is at the Funny Bone. The Rocking Dead opens at Shadowbox Live, with shows through the weekend. 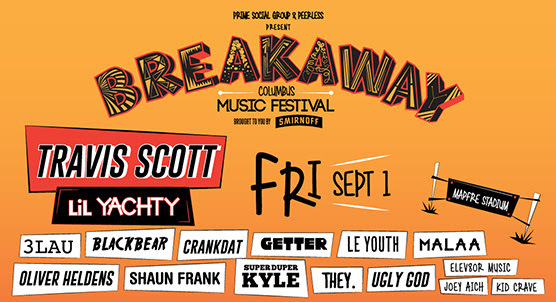 The Breakaway Music Festival returns to Mapfre Stadium for two days of great music. Head to the Greek Festival, happening through Monday. Artist Christopher Burke has a new show at Brandt Roberts Galleries, Stillness: Nocturnes. Columbus Commons has a free Concert ft. McGuffey Lane. Perfect Arrangement continues at Evolution Theater. It's the last weekend to see San Francisco-based ceramic artist Calvin Ma's new exhibition Blend In. Shop the Pearl Market. Hills Market Downtown has a $15 Friday Wine Tasting. Local 'n Live continues at the Gateway. Clippers take on the Bats. Acro yoga has a festival this weekend. The Nest Theater reopens in their new home in Franklinton with a big party. Attend the first ever Sudanese Cultural Event. The BIA Parade of Homes begins. The Ohio Renaissance Festival begins. The Convention Center opens its halls with an art gallery show, and you can see their new iconic sculpture. Do the rest of Gallery Hop. There's a special joint exhibition for Alison and Nicholas Nocera happening at Pursuit and Surprise! Modern Party. Historic Dublin hosts a Street Bazaar. Share your concerns with Councilmember Michael Stinziano. Experience Tornado Dreams. Bike the CBus is Saturday and is celebrating ten years. Did you get tickets to Nina Turner & Shaun King? Canal Winchester has a Labor Day Festival. Watch The Jungle Book outside at Columbus Commons. Gateway Film Center hosts another Sci-Fi Sleepover. Donatos Powell Store is reopening with a Summer Block Party. Hubbard Grille has a First Saturdays in the Lounge. Tour a micro dairy. It's the final weekend for the Columbus Clippers and there are fireworks after the game. Do the First Annual Little Brown Jog. Go on a Columbus Past, Present, and Future Tour. There's a community cleanup project at the Reeb Avenue Center. It's the final weekend for Zoombezi Bay. The Gateway hosts a Yappy Hour with pets. Shadowbox Live has a free show of Bigger than Jesus: Beatles Tribute at Columbus Commons. Read up on City Council candidate Jasmine Ayers. Another Six Word Stroll and Share is happening in the Short North. Check out the Hotlicks Blues Festival. Studio 35 is playing Chinatown. Shop the Peddler's Picnic at North Market. Clippers have another game. Go to a viewing party for Rick and Morty at Hampton's on King. Platform Brewing is hosting a Yammy release and Clambake. Enjoy Labor Day. Find some cool art at the Upper Arlington Labor Day Arts Festival. See the Topiaries at the Franklin Park Conservatory. The Ohio Taproom has a fundraiser for Harvey victims. It's the Columbus Clippers' final game of the season. Hills Market Worthington has their Labor Day Hog Roast. Check out the Events Calendar for more! Events listed in the Mega Weekend are curated from our events calendar. If you have an event you would like to have considered, please go to the events calendar on Columbus Underground and submit it! Enjoy your weekend! CU's Mega Weekend - Urban Scrawl, Shakespeare and Star Wars, Iconoclash, Johnny Cash and more! Happy Weekend! It looks like we will have a gorgeous weekend, make sure to get outside and enjoy it! There is a public meeting tonight to discuss incentives approved by City Council. Nightlight614 shows The Sandlot. Try some heart-opening yoga moves. The Beeler Gallery opens a new exhibition: Alan Shields: A New Kind of Painting. Yes We Can is having a happy hour fundraiser. Attend a cheese and beer pairing event. Golf Clapbrings the house down at Dahlia tonight. The sixth annual Charles Kleibacker Film Festival is taking place at the Columbus Museum of Art through Saturday with free films. Bark Columbus has an open house at their offices. Pecha Kucha hosts their next series of presenters at 934 Gallery. It's Poetry Night with Jacquelin Smith at Gramercy Books in Bexley. Lil Uzi Vert performs at Express Live! tonight. Congrats to TRIAD Architects on their 20th anniversary! Paranormal investigator Chad Calek and fellow filmmaking investigator Justin Holstein are in town. Actors' Theater continues performances of The Tempest at the Schiller Park Amphitheater. The Obetz Zucchinifest begins tonight and lasts through Sunday. Have you tried Tiger + Lily yet? Or checked out the children's book illustrations at the Riffe Gallery? CATCO is Kids presents SHAKESPEARE AND STAR WARS: VERILY, A NEW HOPE. Fourth Fridays continue in Westerville. Chef Alana Shock is cooking up a tomato stack dinner at Jorgensen Farms. Close out the Rhythm on the Riverseason with a free performance by BalletMet. Do some Latin dancing. Restart House Music brings the original crew to Brothers Drake. ComedySportz has some improv shows through the weekend. Columbus Summer Beerfest is happening at Express Live! on Friday and Saturday. Park Street Festival is back this Friday and Saturday. Grandview Theater and Draft House starts a new series: Le 90's, showing Clueless. Or, go to Studio 35 and watch The New Hollywood: Classic Hits - The Thing. Participate in a Late Summer's Local Harvest Dinner Party at The Kitchen. Craft Brew at the Zoo is happening. Stop by Hammond Harkins Galleries for an opening reception for Chasing Masters: Mark Bush and Dennison Griffith. Check out the lineup for Local 'n Live at the Gateway. The Big Room Bar celebrates two years. Best of Shadowbox Live continues. It's the final weekend for MadLab's vibrant play Counter/Top. Urban Scrawl takes places Saturday and Sunday in Franklinton. There are plenty of Farmers Markets to shop. Take a watercolors class with artist Yao Cheng. Get on the schedule to do yoga with cats. The Milo-Grogan Community Center hosts the 2nd Annual Think Make Live youth summit. Enjoy the first Somali Culture Festival at Northland Performing Arts Center. Popular series HOOT is at the Gateway Film Center with a back to school theme. Councilmember Stinziano hosts community hours. Learn to sew a bag at Sew to Speak. Head to Canal Winchester for #PunkAGMUSA2017 and Official Grand Opening of BrewDog Columbus. Learn what bitters can do for your body. Attend an arm balance workshop. Breathe Carolinaplays at Dahlia. Iconoclash presents The Cars & Talking Heads Dance Party at Ace of Cups. Start learning the moves to Michael Jackson's Thriller. Hip hop party O-GEE is going down at Copious. Bruce Campbell's book signing is sold out, but The Sick World of Doctor Show presents: THE BEST for BRUCE and is hoping he will attend! Head to the Scioto Audubon for a Community Rock Climbing Festival. Ohio Village invites you to March Through Time. Celebrate the India Festival, happening at the Ohio Expo Center. It's the final Grandview Hop of the season. The Summer Session is also in Grandview. Nite Owl Theatre returns to Studio 35 with FROM DUSK TILL DAWN. It's the last Lobster Days at Hills Market Downtown. Ill Mannered Brewing celebrates two years. Are you doing the Buckeye Bar Crawl? Check out a Tribute to Johnny Cash with live music, whiskey, and bourbon flights at Soul at The Joseph. Westgate Farmers Market hosts a farm to table dinner fundraiser. Laughing Ogre Comics hosts the AfterShock Tour, featuring Joe Pruett. Mojoflo performs at Natalie's. Shop the Craft Market at Tremont Center. Are you watching Mayweather vs McGregor? Do Fox and The Yoga. Cheer on the Columbus Crew SC. Experience the topiaries at the Franklin Park Conservatory. The Smithery invites you to a Make & Take Metal Stamping event. Enjoy a Six Word Stroll and Sharethrough the Short North and the murals. Rock of Ages has their final performances at Shadowbox Live. Studio 35 has more New Hollywood: Classic Hits with MASH. The Main Library hosts Carnegie Author Series with Kimberla Lawson Roby. TRISM hosts a Summer Campus Bazaar. Shop the Peddler's Picnic. Take a drum lessonwith Ryan Brown, drummer of Dweezil Zappa. We know you're probably ready for today's solar eclipse. And we can't wait until 2024 when we will be much closer to the path of totality. Be safe and enjoy this exciting event! Speaking of events we've got a few planned for this week, including a Group Dinner at World of Beer tonight, a Professional Development Networking Event on Wednesday, and the return of our Grandview Pub Crawl: Six Bars in Six Hours on Saturday! Get your tickets now for next week's CYP Club Night Out with the Clippers too! Find these events and more at cypclub.com/events. Thanks for your support through membership! Save the Date! CoffeeFest returns! Join us for CoffeeFest - Returning for 2 days! Join us for the second annual Columbus CoffeeFest! Tickets will go on sale Monday, August 28th at Noon. Don't miss out, last years event sold out in less than 4 days! This year we are bringing back the CoffeeFest - Bigger and better than ever with 2 time slots for you to choose from to come meet and greet with local coffee shops, tastes their brews and a chance to buy some beans and swag! Plus, we are adding an all new Pre-festival party on Saturday night with a coffee inspired bar menu, live music from Topher James and Biscuit Brigade and exclusive coffee treats from our sponsors! It happens again on September 30th and October 1st at the Ohio Village. Thursdays are the new Friday: Downtown Live is a chance to decompress from the work week and check out the local music scene. The world-class Columbus Bicentennial Pavilion at Columbus Commons plays host to FREE concerts every Thursday in July that fire-up at 5:30pm. Our local improv group, Hashtag Comedy, will be serving as our MC for this series. Blankets and chairs are welcome; please leave coolers at home. Bar concessions are cash only. Tortilla Street Food and Jeni's Splendid Ice Creams will be open near the carousel. (ATM is located on the south side of the park near Rich Street and Tortilla). located at 191 S. Third St. and 55 E. Rich St.
You can catch Lowe's this week at Commons for Kids with their educational planting activity. They are passionate about helping kids learn and make connections between how easy and fun it is to grow your own plants, and the food that is on the table at dinner. 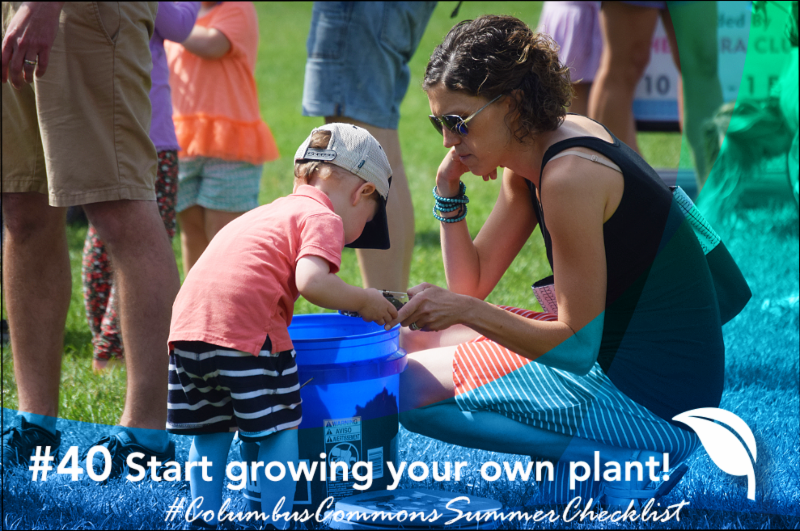 Come out and check out the Lowe's table this Friday, July 28th from 10am - 1pm and check item #40 off of your #ColumbusCommonsSummerChecklist! Burritos, bowls, tacos and more, made with fresh ingredients and authentic flavors. Mexican street food with something for everyone. Dinner at Pies & Pints, Summer Social at City Tavern, Volunteering with Mid-Ohio Foodbank, Nashville Road Trip, and more! Summer Road Trip to Nashville - Full details! New Stauf's Franklinton, Grocery Store on Parsons, Mid-Mod Store in GV, and more! A Night of Art & Wine with DRAC ???? Say Hello to Summer with the CYP Club! [Road Trip] The CYP Club is headed to Nashville! It's HOT out! Cool off with Beer + Ice Cream! BrewDog's new plans, SN streetscape work, Outdoor Yoga, and more! See What's Happening In May! Downtown News Network May 2017! Urban Living Tour is less than a week away! 26 things to do this weekend! Announcing: Whiskey Tasting with Columbus Underground! Columbus Alive Things to Do This Weekend! CU's Mega Weekend - new restaurants, Lantern Festival, Erotica, and more! CU: Huge news for Harrison West, Kindness Month, protest photos, and more! February News and Events from Downtown News Network! Check Out Events In Columbus This Week from Eventful! New Movies at Wexner Center for the Arts from Eventful! CU: OSU Announcement, Drunch, check out this renovation on Bryden Road. CU's Mega Weekend - Beer Fest, Say goodbye to Colo, Winter hikes, and more! Captial Crossroads Latest News and Notes! Find out what's up in C-bus in this week's CYP Club newsletter! The Lumineers, The Flaming Lips and Blue Jackets Tix in Columbus! Tax Tips, New Foodee App, Who's doing Crowdfunding in Jan? CU's Mega Weekend - Craft Brews, Covered Bridges, Blue Jackets, comedy and more! Celebrate Fall at the Harvest Fair 2016! Who will be the Social Entrepreneur of the Year? Join us tonight to find out! CU's Mega Weekend - end of summer, Independents' Day, pawpaws, home tours, and more! NEEDTOBREATHE is coming to the Commons! CU: Franklinton Firehouse gets new life, Hadley's, Oats & Barley, Market District and more! Best Bites Tacos is coming up on Thursday! Get your tickets before it sells out! CU's Mega Weekend - Hot Rods, Beerfest, OZ, Star Wars, and more! Tickets are available at the door tonight for Healthy Bites! FREE Mojoflo Concert at the Commons! CU: New podcast! Mid Ohio Foodbank milestone, SN White Castle closes and more! CU's Mega Weekend - Jazz & Rib Fest, new Actors' Theatre, and more! CU's Mega Weekend - Loads of outdoor music, PromoWest Fest, new Drexel, and more! Free Floorwalkers concert? Yes Please! Sticky Fingers, Brassica #2, legal and retail advice! CU's Mega Weekend - Comfest, Clippers, BBQ, Outlet Mall and more! CU: Big news happening in Franklinton, PRIDE photos, and more! Take a look at the BBQ for next week's event! CU's Mega Weekend - It's Pride Weekend 2016! Picnic with the Pops returns to the Commons! Going to the Arts Festival This Weekend? CU's Mega Weekend - Arts Festival, Picasso, Kevin Smith, Summer Movies and More! Network with us this Summer! Last Call for Early Bird Tickets & a VIP Giveaway! Your Weekend in Columbus! Concerts, Movie Showtimes and Sports! CU: Union Cafe is 20! Summer Movies, Sidewalks for 3rd Ave and more! Baseball Tix, M83, and Purity Ring in Columbus! Building and Zoning tips, health insurance questions, and more! CU's Mega Weekend - Asian festival, pools opening, Drauma, and more! You're invited! FREE summer events on the Scioto Mile! CU's Mega Weekend - Rock on the Range, Dragon Boat Races, Origami and more! FFOCOL coming in two weeks! VIP passes! Announcing Best Bites Barbecue on June 23! CU: New Tower for Downtown, a party shop in SN, New outdoor movie series and more! Are you ready to rock the Commons? Last day for $20 presale tickets! Stop by Moonlight Market 6pm-11pm for yours! CU's Mega Weekend - Start of Summer Weekends that are packed with things to do! Another round of Speed Networking on May 17! Columbus Commons: There's more in store for May! CU's Mega Weekend - Grand Openings of lots of places, Festivals, and more! CU: Big update for Franklin Park Conservatory, Festival List is out, CBUS update and more! CU's Mega Weekend - Cinco de Mayo party, Truth Booth, Comedy Film Festival, and more! Urban Living Tour returns May 15! Tickets on sale now. CU: Vanessa Williams, Tabletop Game Cafe, Retro Cookie Shop, and More! 24 Things to do this weekend! CU's Mega Weekend - Front Street Funk, Tulips, Bacon, Bourbon, and More! Earth Day & The Capital City Half Marathon are coming to the Commons! What's Next for Little Brothers space, Carabar on the move, Urban Living Tour and more! Justin Bieber, Frightened Rabbit, and Ellie Goulding in Columbus! So much is in store for season number six! CU's Mega Weekend - Clippers opening night, Ben Folds, Lydia Loveless documentary and more! Justin Bieber, Frightened Rabbit, and Dave Matthews Band in Columbus! CU: Daily Growler + Burritos, April Fool's Roundup, The Full Monty at the Short North Stage! Only 28 tickets remain for Best Bites Pizza this Thursday! CU: PromoWest Fest lineup, big news for Dublin river front, dog cafe, and more! AC/DC, Dave Matthews Band, and Vance Joy in Columbus! Do you have your ticket to the city's best Brunch? 03-18-2016 Your Weekend in Columbus! Concerts, Movie Showtimes, and Sports! CU's Mega Weekend - St. Patrick's Day, Huge Litter Cleanup, and much more! 21 things to do this weekend! A Date 2 Remember is two weeks away! Events to Experience this Weekend! Valentine's Day Concert, Upcoming Events, and MORE! The Columbus Experience NYE 2015! City Music Columbus is Growing; Join in the Fun! Football Tix, Ben Folds and Justin Bieber in Columbus! C'mon to the Commons to see the Holiday Lights! CU's Mega Fall Weekend - Enjoy your holiday weekend! Columbus SOUP winner, SBA award nominations open, plus we're on Instagram! See you Wednesday at Juvly Aesthetics? Coworking space in German Village with Yoga and a healthcare open house tonight! Food Truck Expo coming in Feb plus a growing franchise! CU: Rigsby's Kitchen closes the doors; a new flag for Columbus? Bengals Tix, The Swon Brothers and Zac Brown Band in Columbus, OH! A new look for The Metropreneur e-news! CU's Mega Fall Weekend - Tweed Ride, Trucker plays and more! 11-05-2015 Best tips to run your business and get info about how to grow yours! Football Tix, Zac Brown Band and A Thousand Horses in Columbus, OH! Join The Metropreneur for Aspire and find out more about the big investment in the Idea Foundry by Nancy Kramer and Christopher Celeste! CU: Another #1 for Columbus plus what's new for the old Little Brothers space? CU's Mega Fall Weekend - HighBall, pumpkins and more! See you tonight at 6:30 for DRAC's Candidates Forum! Are you coming to DRAC's Candidates Forum Next Tuesday, October 20? Browns Tix, Jason Aldean and puddle of mudd in Columbus, OH! CU: What's happening with the old Red Zone? Find out the best sandwiches in Columbus! 10-01-15 Best tips to run your business and get info about how to grow yours! C'mon to the Commons for the Party under the Stars, CSO Simulcast, Harvest Fair and more! Indians Tix, Zac Brown Band and Modest Mouse in Columbus, OH! CityMusic Columbus Presents CALJE and MORE! C'mon to the Commons for the Beer & Film Tour, Bacon Fest, ALS Walk and more! Browns Tix, Machine Head and Modest Mouse in Columbus, OH! CityMusic Presents, Great Deals, and so much MORE! CU: Hotel Proposed for Park Street, Google Express, plus - would you eat that? Best tips to run your business and get info about how to grow yours! Reds Tix, Counting Crows and Taylor Swift in Columbus, OH! C'mon to the Commons for a Block Party & FamJam, Free Alive Concert and more! Best Bites Taco Winner, and thank you to our guests! C'mon to the Commons for the Central Ohio Heart Walk, Free Fitness, Group Runs and more! See you Wednesday at the Lazarus Rooftop Garden & Mojoe Lounge? CU: Food Truck winner announced, a new building for Long Street? 08-17-15 Reds Tix, Shania Twain and Taylor Swift in Columbus, OH! CityMusic Columbus Announces Its 32nd Concert Series! What's in store at our Tenth Anniversary Block Party? More tacos added to Best Bites Tacos and tickets almost sold out! C'mon to the Commons for Free Food Truck Festival, Fitness and more! CU: West Broad Target closing, Vote for your favorite Food Truck! Indians Tix, Shania Twain and Counting Crows in Columbus, OH! C'mon to the Commons for Free Fitness, Pelotonia and more! C'mon to the Commons for a Free Bastille concert, Popgun + Reaganomics and more! Reds Tix, Shania Twain and Taylor Swift in Columbus, OH! C'mon to the Commons for Mojoflo, Popcorn pops, a Free movie more! CU: Lots of design news around South Campus, Short North! C'mon to the Commons for Downtown Live Concerts, Pink Martini and more! See you Wednesday at the DRAC Downtown Development Panel Discussion? CU: Explore treehouses, Yellow Springs, sharks, motorcycle trips, and more! C'mon to the Commons for Downtown Live Concerts, The Commodores, and more! Baseball Tix, Three Days Grace and Counting Crows in Columbus, OH! C'mon to the Commons for Patriotic Pops, Downtown Live Concerts and more! Reds Tix, Taylor Swift and Counting Crows in Columbus, OH! C'mon to the Commons for Food (truck) Fight, Popcorn Pops, a free movie and more! C'mon to the Commons for Picnic with the Pops, Popcorn Pops and more! See you Wednesday at Mikey’s Late Night Slice & Red Brick Occasions? CU: Brewdog is coming to Columbus, find out where! And could historic tax credits end? Baseball Tix, Imagine Dragons and Taylor Swift in Columbus, OH! C'mon to the Commons for free Navigators concert, Blues music and more! Baseball Tix, Counting Crows and Taylor Swift in Columbus, OH! 06-04-15 Best tips to run your business! C'mon to the Commons for lots of live music and more! CU: Franklinton has some surprises coming this summer! Reds Tix, Counting Crows and Imagine Dragons in Columbus, OH! CU: The Big Give is tomorrow, One week to Urban Living Tour! 05-07-15 Best tips to run your business! Summer Sports Leagues: Kickball, Flag Football, and More! Indians Tix, Counting Crows and Taylor Swift in Columbus, OH! Last Call for Tickets! CU and Shadowbox Live present Best Bites Burgers! Will sell out! Next Week! CU and Shadowbox Live present Best Bites Burgers - plus Graeter's! Buckcherry, Taylor Swift and Peter Frampton in Columbus, OH! 04-09-15 Best tips to run your business! Baseball Tix, Taylor Swift and Kenny Chesney in Columbus, OH! CU: Huge building announced next to Columbus Commons. Lineups for Music Festivals! Peter Frampton, Rush and Kenny Chesney in Columbus, OH! CU: Best Bites Burgers, Presented by CU and Shadowbox Live announced, plus IV updates! Taylor Swift, Kenny Chesney and The Who in Columbus, OH! Blue Jackets Tix, The Who in Columbus, OH! Columbus Underground's Mega Weekend for Feb 26-March 1 - win tickets to Bunbury Music Festival! CU: Big News for Milo-Grogen, Find out the Best Bites Sweet Treats winner! Blue Jackets Tix, Rush and The Who in Columbus, OH! CU: Transit Columbus Map Contest, Best Bites Sweet Treats feature bakeries, new contests! Blue Jackets Tix, Mastodon and Kenny Chesney in Columbus, OH! Best tips to run your business! Blue Jackets Tix, Kenny Chesney and Mastodon in Columbus, OH! Blake Shelton, Bush and Kenny Chesney in Columbus, OH! CU: Health & Wellness feature the best tips to start 2015 off right! Blue Jackets Tix, Miranda Lambert and Kenny Chesney in Columbus, OH! Columbus Underground's Mega Weekend for Dec 31-Jan 4 - Happy New Year! Blue Jackets Tix, Bush and Kenny Chesney in Columbus, OH! CU: Holiday Shopping Wraps Up, Kasich under review, Best of 2014! Bengals Game Tix, Kenny Chesney and Bush in Columbus, OH! Browns Game Tix, Bush and Kenny Chesney in Columbus, OH! Football Game Tix, Blake Shelton and Kenny Chesney in Columbus, OH! CU: Madison Building Sells, aerial yoga, the best stage play! Blue Jackets Tix, Blue October and Miranda Lambert in Columbus, OH! Browns Game Tix, Blue October and Blake Shelton in Columbus, OH! Football Game Tix, Blue October and In This Moment in Columbus, OH! Football Game Tix, Blue October and Rascal Flatts in Columbus, OH! CU: Have you heard of The Walrus? Football Tickets, The Airborne Toxic Event and Blue October in Columbus, OH! CU: Largest Wallscape in the World, Kahiki patio party Oct 5, Parking Meters going or staying? Pat Benatar, The Kooks and Trans-Siberian Orchestra in Columbus, OH! The Kooks, Theory of a Deadman and Pat Benatar in Columbus, OH! CU: HOMAGE moving to High St, ZombieWalk photos, Spirits Week! Jason Aldean, Blue October and Theory of a Deadman in Columbus, OH! CU: New plans for Barrett, A World of Beer at South Campus Gateway, and more! Journey, Theory of a Deadman and Blue October in Columbus, OH! Get Lunch; Gin Blossoms; Fresh A.I.R. CU: Win tickets to sold out Best Bites: Burgers, The Olympic development, Street Thyme voted best food truck! Jason Aldean, Journey and Blue October in Columbus, OH! CU: Gourmet Burger Tasting event announced, Urban Food Hub proposed! Journey, Theory of a Deadman and Jason Aldean in Columbus, OH! Chevelle, Blue October and Theory of a Deadman in Columbus, OH! CU: Hollywood Sign goes up in Weinland Park, Urban Living Tour set for July 27, and more! Blue October, Chevelle and Theory of a Deadman in Columbus, OH! Lady Antebellum, Modest Mouse and Chevelle in Columbus, OH! Chevelle, Modest Mouse and Lady Antebellum in Columbus, OH! CU: Explore Columbus Week roundup, Franklinton development updates, and more! 311, Blue October and All That Remains in Columbus, OH!